After cleaning, repairing, and reassembling your carburetors, you’ll need to balance and synchronize them. 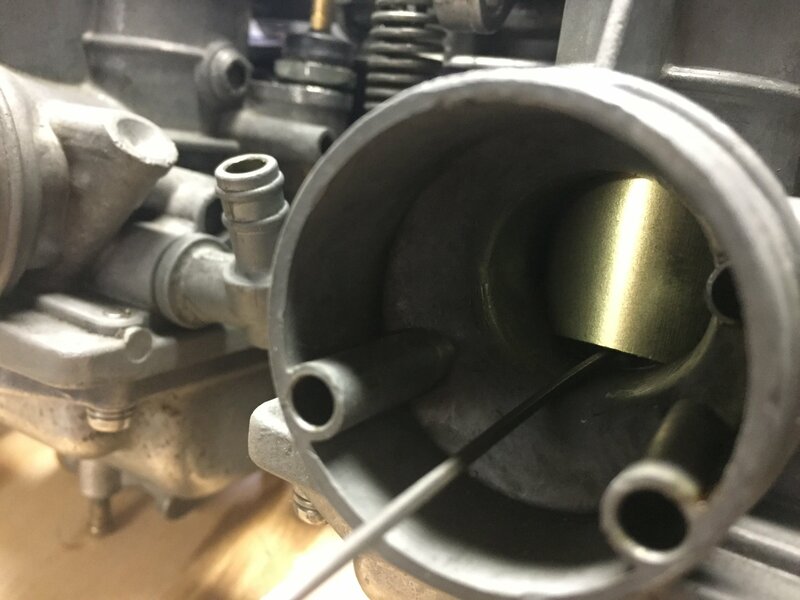 A complete carb synchronization typically starts off the bike with a static carb bench synch followed by a vacuum sync with a carb sync tool after the engine is warmed up. After you’ve cleaned and reassembled your carbs, you can perform a bench sync to help make vacuum syncing the carburetors on the bike much easier. 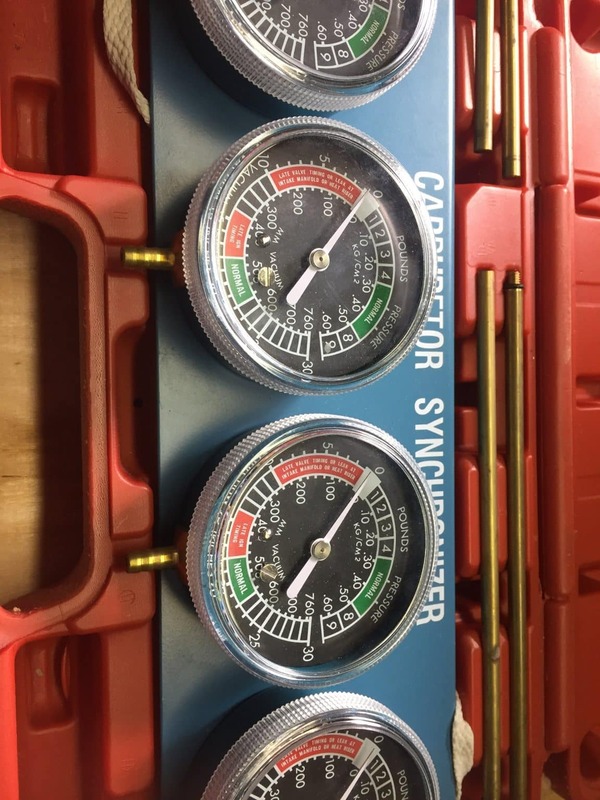 After you finishing your carburetor bench sync, install the carbs on the motorcycle and continue with the vacuum synchronization and setting the idle speed. Refer to your service manual for exact carburetor adjustments. Find a small wire or drill bit about .5 to 1.5 mm in diameter. Position your carbs so you can reach the throttle slide adjusters and lock nuts. Start with one of the slides and insert your wire or drill bit so that it sits flush with the bottom of the carb throat. Set the throttle slide so that you can barely remove your wire/bit gauge. Repeat for the remaining carbs. Recheck that each slide closes at the same position and that the wire/bit has the same clearance in each carb. Be careful not to scratch or mar the carburetor body or the slides. Your carbs are bench synced! To adjust your motorcycle’s idle, you’ll typically need to adjust the airscrews and the idle adjustment screw(s). The airscrew is typically set a half turn to one and a half turns from its bottom. Turn the idle screw until you get the lowest idle within the recommended range. Turn the idle air screw to improve the idle. Adjust both screws to get a smooth idle. Confirm the proper idle with a vacuum sync and by pulling the spark plugs and inspecting their color. Bring the engine up to operating temperature. At idle, adjust each carb until the vacuum readings are within about 2 cm Hg of one another. Work in pairs, matching the 1 and 2 carbs together, and then the 3 and 4, and then the pairs together. Bring the RPMs up to about 3,000 and make sure the vacuum reading rise at roughly the same rate and stop in the same position. Syncing the carbs and making adjustments will be easiest if you have an auxiliary gas tank. With the tank installed on the bike it can be nearly impossible to make the proper balancing adjustments. Check your motorcycle shop manual for specific adjustment procedures. You can further tune your bike at all throttle ranges with a plug chop. For motorcycles with more than 1 carburetor, you’ll need to sync them at idle and at advance RPM to make sure your bike will run properly. If your carbs are out of balance, the cylinders will be fighting against each other, causing a lot of excess vibration and rough operation. 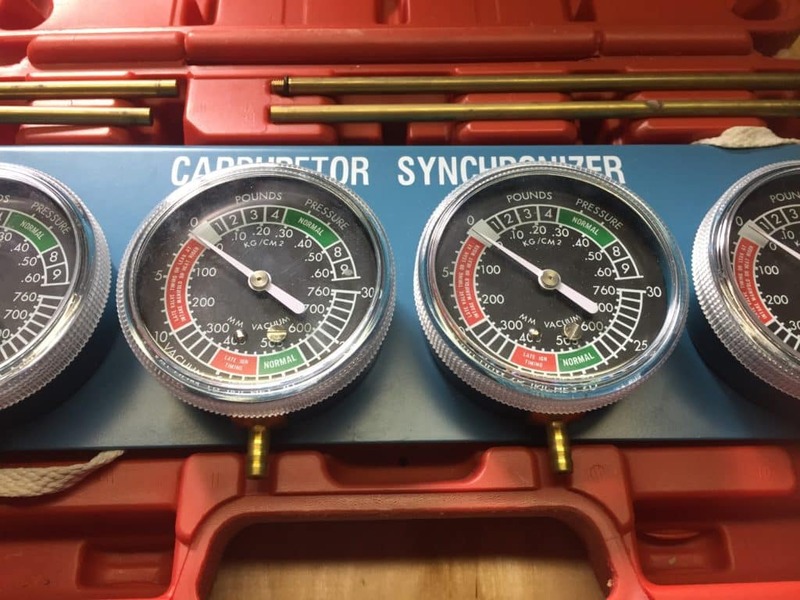 The best way to sync carbs is either with a vacuum sync or manometer tool. Most carburetors will have hose connections or screw-in fittings near the front of the carb that will allow you to hook up your sync tool. When syncing carbs, it’s a good idea to point a fan at the engine to help keep it cool. If you find you’re having trouble, take a break and let the engine cool down before you continue with the synchronization. If you’ve changed the intake or exhaust set up on your bike, you may need to rejet your carbs to get them to run properly.